Recruitment to the army is one of the defining images of 1914 in Britain and in London in particular – Kitchener’s call to arms and the queues outside recruiting offices. A week-by-week breakdown of recruiting rates reveals that the pattern of enlistment in London was not quite the same as across the UK as a whole. September 1914 was the peak month for recruitment to the British Army during the Great War. Half a million men joined the army during the month, most of them during the first week and a half. On 11 September, the army increased its physical requirements of recruits. This (possibly coinciding with a natural end to the extreme levels seen after the news from Mons arrived at the end of August) resulted in a very rapid decline in recruiting. Over 190,000 men joined up nationwide in the first week of September, but only 40,000 did so in the week of the 15th to the 21st a fortnight later. London’s recruiting pattern was basically the same as that of the UK as a whole, with the peak weeks of recruitment being the first two weeks of September, followed by a decline. An interesting facet of the figures, though, is that the peak was less pronounced in London than in the UK as a whole. One way to observe this is that the peak weeks (1-7 and 8-14 September) saw London’s recruits make up a smaller proportion of the UK-wide figure than in any other week in August or September (see graph below). Overall, just under 18% of August’s recruits came from London and just under 15% of those who joined up in September. Another way, that tells a different aspect of the story is that of the men who enlisted across the UK in the period 4 August to 28 September, a third joined up in the first week of September. For London alone, the figure is 25%. London’s peak of recruiting was very large, but it was less extreme compared to the weeks either side of it, when London provided proportionately more of the nation’s recruits. Historian David Silbey (in his book The British Working Classes and Enthusiasm for War in 1914-1916) describes the recruiting boom as behaving like a ripple coming out from London in August and early September, with London disproportionately affected in August. The pattern after September was not even. In October, over 22% of all recruits came through the London recruiting district (which covered the Metropolitan area of Greater London, not just the county of London as it existed in 1914). The figure fell below 15% for the next three months, before settling around 18-23% for the rest of 1915. From the 1915 average of 20%, the proportion fell under conscription to around 14.5-16% in the remaining years of the war. The wartime average was 17%. So, what does this tell us? First of all, it tells us that the pattern for recruitment was different in London to the UK as a whole, with more enlistments in the first weeks and less of a pronounced peak in early September. Second, it tells us that around 17% of recruits came through the London district, which is around what one would expect for a region (Greater London) housing around 7 million of the nation’s 44 million people. Note on War Office recruiting figures: the figures for August and September do not tally exactly between the daily and monthly returns. 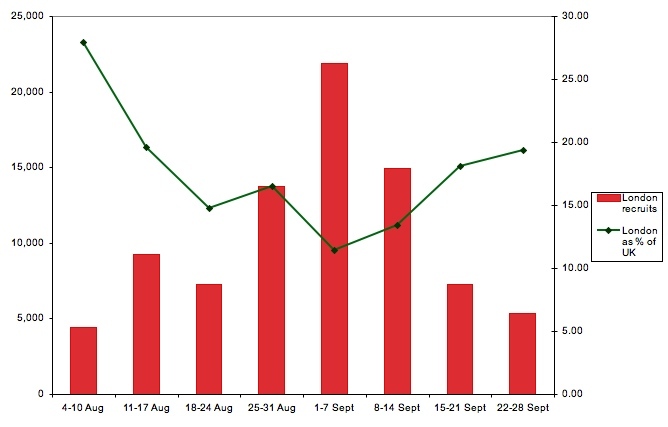 The daily figures have been used here for August and September – allowing for a weekly breakdown – the monthly figures are quoted from October onwards. The proportions of recruits brought in through the London recruiting district were broadly the same though: 18.5% in August 1915 and 14.63% in September in the monthly return, compared with the above-quoted daily return figures of just under 18 and 15% respectively. Over 90,000 German military personnel were held as internees or prisoners of war in Great Britain in 1914-18. One day in October 1917, one of them walked into a restaurant on Jermyn Street. Paul Scheumann was a German army Lieutenant, held captive at Yatesbury airfield in Cherhill, Wiltshire, with over 700 other German servicemen. He was in charge of a working party of German prisoners of war (prisoners were used for manual labour near to their camps during the war) and, one day in October 1917, he crawled under the camp wire to retrieve a suit he had made out of army blankets and hidden near to the camp. He then went and bought a mackintosh Chippenham and got the train to London. Lieutenant Scheumann arrived in London late on Tuesday 16 October. He went out and bought a kitbag, some boots and new clothes then went to the theatre, before checking into a hotel in the West End. He checked out the next day after lunch and moved to Bellomo’s private hotel at 102 Jermyn Street, Piccadilly. Bellomo told reporters that “The ‘145’ being placed at the end of the name of the street aroused my suspicions, as all Germans write the number thus.” He also felt that the handwriting looked German (especially the ‘1’ in ‘145’). He allowed ‘Mr Mann’ to check in but kept an eye on him. That evening ‘Mann’ again went to the theatre, apparently to see ‘Trelawny of the Wells’ at the New Theatre. 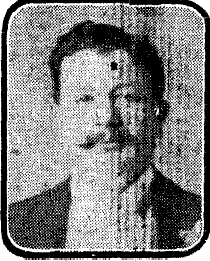 Andrea Bellomo applied successfully for British citizenship in 1919 but only lived until 1927, when he died in Cranbrook, Kent, where he and Mrs Bellomo had moved after the war. Nellie (Ellen Maria) Bellomo lived on in Cranbook until her death in 1963. It is intriguing to think that a German officer was able to spend 36 hours at large in London, dressed in a home-made suit and speaking with a noticeable German accent. The vigilance of Bellomo and his guests and staff helped to send Scheumann back to his prisoner of war camp. He was, though, only one of many Germans at large at that time, as escapes were surprisingly common: newspaper reports of Scheumann’s capture also noted the details of two more escaped German prisoners of war. We are used to the image of British servicemen in the Great War trudging through the mud of Flanders. Not all served on the Western Front. Many served in the Middle East, the Balkans and Italy; others ended up in India and Burma. D.E.G. Quelch was one of a lucky few who ended up in a paradise far from the Flanders mud. British soldiers, and those of the Empire and Dominions served all around the world during the Great War. In early 1918, there were 3.77 million British (as opopsed to imperial or dominion) soldiers in the army, of whom 2.3 million were serving overseas. Of that number 2.17 million – more than 90% – were serving in the theatres of war around the world: France and Flanders, Italy, Mesopotamia (Iraq), Salonika, Palestine and in East Africa. Another 17,237 were manning garrisons around the Empire and 98,645 were serving in India and Burma (along with 388,599 native Indian troops). Sir,-Before leaving Rangoon I received a copy of the Staff Gazette and read with much interest the doings and whereabouts of some of the staff. I thought it quite an excellent idea, which should help to bring old members into touch with one another. Since leaving England I’ve been in Malta, Egypt, India and Burmah, and now on special duty in charge of a detachment at Table Island, about 350 miles south-west of the Irrawaddy mouths and 150 miles north-east of Port Blair and the Andamans, in close proximity to the Cocos Islands (well known in connections with the Emden raids). The island, or rather islands (as Table is joined to Slipper at low tide) are uninhibited jungles, the only attempt at civilisation being the wireless station. Landing is only made by small boats owing to the dangerous nature of the coast. We are quite out of touch with everything outside as we get no news or mails except when a steamer calls with fresh supplies, every two months or so. Quite a contrast to his native Camberwell! The Coco Islands consist of the main Great Coco Island and the smaller Little Coco Island, separated by the Alexandra Channel. Table Island, a third small island located near Great Coco Island, previously housed a lighthouse but is uninhabited. Slipper Island is an islet located off the NW point of Table Island. The Cocos may have been known in 1917 in connection with the Emden, a German cruiser that marauded around the Bay of Bengal in 1914. Today, they are better known for the alleged use by (or sale to?) China. Quelch’s unit do not appear to have made it to Europe in 1917-18. Twenty three men from the 18th Rifle Brigade are listed by the Commonwealth War Graves Commission as having died in Burma in 1916-1919, along with another eight commemorated in India. Like Quelch, these men were mainly over military age, being in their forties and even older when they died (one was 61). Many of them had originally joined other battalions (often in the London or Middlesex Regiments) as volunteers or from the National Reserve but were transferred to the 18th Rifle Brigade for this garrison duty in India and Burma. Almost all were Londoners. Statistics of the Military Effort of the British Empire.